It’s been 4 months and we’re back fellow devil watchers! I hope that 24: Legacy and APB were good because I didn’t watch either one of them. Now before we begin I have news for everyone. 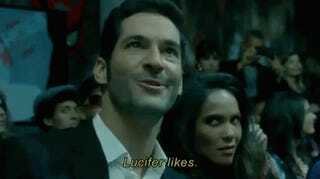 First, if you missed the announcement, Lucifer is coming back for a third season and it will be a full 22 episode long season. Second they cut out four episodes of this season so we’re only going to be back for 5 weeks instead of 9. Why? I don’t know but since those four episodes are going to be the first four episodes of season 3 I guess we’ll see around the fifth episode. Anyway, now that that’s out of the way, Welcome to the Lucifer season 2 episode 14 “Candy Morningstar” spoilerific reaction, where you can share your thoughts on the show as it plays out or after it’s done. The person who Lucifer is hiding out with. Actual Usage: Or his new wife, whatever.